The voltage in Croatia is 220V; the frequency is 50HZ. 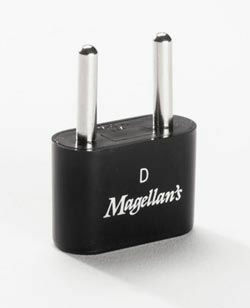 Plugs are two round prongs. All is well for continental Europeans but Americans have flat prongs and 120volt/60HZ appliances. Before leaving home, find out whether you'll need a transformer or an adaptor or both. They are not the same thing! A transformer converts the electrical current while an adaptor simply allows the prongs to fit in the wall. See a selection of plug adapters and a selection of voltage converters. Many, if not most digital cameras, laptops, cellphone chargers and other paraphernalia will automatically switch between currents. All you'll need is the plug adapter to charge up your device. Most hairdryers (except travel hair dryers) will need a transformer and an adaptor or they will burn out. Most Croatian hotels and private accommodation can supply you with an adaptor, but not a transformer. Otherwise you'll need to head to an electrical shop or buy one in the airport (a more expensive option). If you only need a transformer for your hairdryer, it may be cheaper to simply buy a hairdryer in Croatia (or ask your hotel or proprietor for a loan).